Tangled up in all that yard work? Break free with the revolutionary Flat Hose. This amazing flat coiling garden hose is guaranteed to take the mess out of watering. Flat Hose attaches easily to any faucet. Guaranteed to never kink, never tangle and never tear. Watering your plants or washing the car has never been easier. 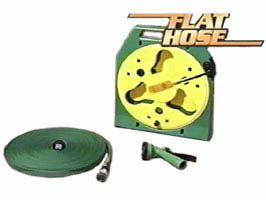 This flat water hose is based on the same technology that has been used for years on fire hoses, the compact 50ft Flat Hose is made of a tuff, yet flexible material. With Flat Hose simply turn on the water and watch it expand for a full, unobstructed flow. Rubber hoses can weigh up to fifteen pounds, but the Flat Hose is so lightweight that you can easily move it for any job, anywhere. With Flat Hose just turn off the water and it goes back to its flat shape.